I know that January is a popular time for starting to make new plans, followed by September when we get caught up in all the talk of a ‘new term’. But actually, any time is a good time to start making and acting on new plans. It’s never too late to sit down, work out where you are now and where you want to be, and prepare a strategy of how you are going to get there. Maybe you did do that in January, and now half way through the year have realised that you veered off course, got side-tracked or distracted (oooh shiny…), or forgot what you were aiming for. So when should we make plans? Let me introduce you to the real perfect time to make a plan… NOW. 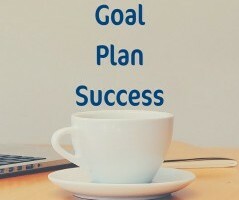 It doesn’t matter if it’s not a Monday, or the start of a new month or year, get yourself a cuppa and read on to find out why you need a plan for your business, starting now. I’m not talking the types of business plan you need for the Bank Manager, full of financials and forecasts (though you will need to understand your figures), but a plan to get your business from here to there, whether there is having x amount of clients, working so many days or hours per week, earning a certain amount of money or whatever else your dream goal might be. Where are you going, and how will you get there? You wouldn’t go on a car journey without knowing where you were going, and you wouldn’t start following a recipe without checking you have the necessary ingredients, equipment and skills. It’s the same with a business. Without knowing what end result you are aiming for, and what you need to do to get there, you are aimlessly drifting along. And while that might well work for some time, you will eventually run out of steam and wish you’d made a plan earlier. You need a plan of the goals you want to reach and how you’ll get there. I know that when you start your own business you often just want to dive in and get started but research shows that writing down your goals is a key driver in helping you to achieve them. Let’s start preparing a strategy for the successful growth of your small business and looking at the goals you want to accomplish. This can give you focus and inspiration, we can all do with a dose of that from time to time. Begin by looking at your business as a whole. Think about where you are now and where you’d like to be in 3-5 years. Ask yourself what your key objectives and goals are for your life and for your business – they could be creating a better work-life balance, moving from a home office into a business premises or even taking on new staff. Business gurus have long found that if you focus on the five SMART aspects then you’ll be much more likely to reach your goals. And during a chat over a cup of tea with Tracey Baum earlier this year, we realised that while doing those bits is good, why people usually fail is that they don’t acknowledge WHY they are setting these goals. What will it actually achieve for your business, and why do you want that? Don’t set goals because you think those are the ones you should have, make them attractive. Have x amount of income per quarter = this allows me to book lovely holidays for my family. See how thinking of the benefits makes this goal more attractive! We’re not talking about a pretty logo here. Having a brand is vital to building a successful business so think about what your brand values are. What are the core values of your company and how do you express this to your clients? What do you want people to think or feel when they encounter your business? What do you want to be known for? This takes some real thinking and brainstorming, maybe ask existing clients how they perceive your business currently. When you have your list of brand values, make sure you are consistent and have these in mind for any new services you devise and any communications you put out. Maybe not all of them for everything you do, but most each time. Some of my brand values are efficiency, honesty, friendly, straightforward and professional. If a system I advise for a client isn’t efficient and straightforward for them, then it’s not what I should be working on. I am open and honest with my clients and enquirers. I want to be thought of as friendly and approachable, yet professional. Another great point for your branding is to understand what your unique selling point (USP) is. This is the one thing that distinguishes you from the competition. To help you with this do a competitor analysis. What can you offer customers that your competitors don’t? It’s a busy market place for many small businesses so having a competitive advantage is a must. Whether you decide to focus on price, product or service make sure that you keep your USP at the very heart of your business strategy. And please don’t say that your USP is you. Every business owner is a unique person, they all bring something to that business that is unique to them, but you are NOT your USP. It’s also a great idea to take the time to think about who you want as your ideal client. Picture your perfect customer in your head – you could even give them a name if you like! Ask yourself where they live, the type of job they have, what do they like and dislike? What worries or problems do they have? Where do they look for help with these? What they will hope to gain from buying your product or service? Once you have brought them to life then use them to inform your strategy going forward. Whenever you consider a new strategy ask yourself what your customer would think about it and whether they would approve or not. Do your services currently address the problems they have, in a way that they would like to access them? Also think about who you want to work with. Is there a particular target audience that you enjoy working with? Maybe your current or past clients are not the right fit for you, and by planning who you do want to work with, can help you form a new strategy to bring them your way. I know that I can work my magic with any small business owner, but I much prefer to work with women and in particular mums. I need to know what issues they have with running their businesses while raising their children, and how they would like to be helped. And a useful part of that is the fact that I am that person too! Marketing is vital if you want to get found by potential customers but it can also be hard to get it right. Consider which marketing channels have worked for you and which haven’t. Are you utilising them to full effect, or do you need to get some help to work out where you should place your efforts and budget? Are you missing something that could work wonders for your business? If there are any untried channels, you might want to think about using them so you’ll need to decide whether you need training to get the most out of them, or if it could be worth getting advice from an external marketing consultant. I know I’m probably not going to be able to convince you that finance is fun, but it is essential to running a small business. It can sometimes be a bit of a revelation to find out how much you earned when you do your accounts once a year, for the tax returns. If it’s lower than you hoped, and you had known months before, you could have made some changes to start to increase your income. And if one of your goals is to earn a certain amount, how can you know if you are on track if you never measure this? Make sure that your cash flow forecast is up to date and that you have the budget for any changes or work that you are planning. There are some great accounts packages online which are specifically designed to help small businesses so consider investing in a subscription to one of these. If your finances are under control you’ll feel more in control of your business too. Once you have considered all of the above then it’s really important to finalise your goals by writing them down, as this will set them in stone for you and give you a vital point of reference as the year goes on. However you can get as creative as you like when it comes to capturing your strategy. Some people might choose to handwrite their goals in a special notebook, some might use a project management spreadsheet and others might like to show their goals pictorially in a vision board. Now you have your strategy, keep it close at hand. Refer to your goals on a regular basis to keep you on track. It’s a good idea to review your strategy every 3 months to make sure you are still happy with your goals, and make any tweaks or changes your strategy may need. Things change, in business and your home life, so I wouldn’t expect all of your goals and plans to remain the same throughout the year. Don’t forget to celebrate your achievements and make a record of every time a goal is reached! If you need help with any of this, to be guided in the right direction or to work with someone to map it all out, then you are my ideal client! Let’s have a chat over a cuppa and see what we can do together.